My garden is in the absolute wrong spot! In my defense I didn't put it there, but that does not change the fact that it doesn't get nearly as much sun as it should. You see, the sun travels across the sky on roughly the same path every day. Where my garden is, some of it doesn't get full sun until after noon. This means that many of my full sun plants don't get nearly as much sun and part of my garden is practically useless. Not knowing my sun pattern was an expensive gardening mistake. I could have avoided this if I had made a sun map of my garden way back in the beginning. Had I made a sun map of my property and then chosen a spot for my garden based on that, I'd have much better harvests from my garden because I'd be able to plant more efficiently! Even if you already have a garden plot that your sticking with, a sun map can help you plan your garden more efficiently. 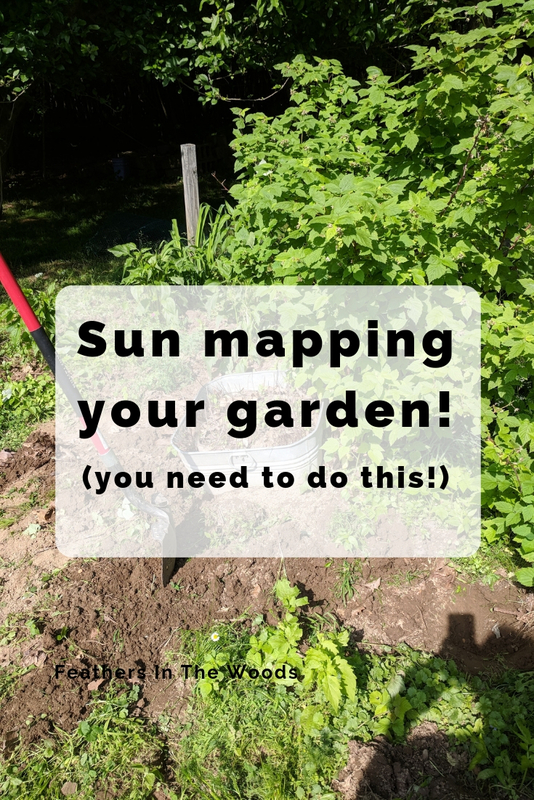 It's super easy to make a sun map and once you have one it makes garden planning much simpler. First of all, don't be like me! When we first moved here I looked around at all the things I had never grown before and thought the former owner must have been an amazing gardener! A mini weeping cherry tree in a color I had never seen, flower filled rock gardens, grape vines, exotic colors and styles of lilies, apple trees and more were growing throughout the yard. I thought they had known what they were doing! So I used the garden plot they had already dug. In fact, I expanded it. Twice. I quickly found that many places in my garden were too shady. Things that needed a lot of sun like corn didn't grow well in most of the garden. The apple trees were directly under the canopy of leaves from the woods and had constant problems. The grapes developed a fungus problem from being planted where they didn't get enough ventilation. In fact, over the next few years...pretty much everything that had been here, failed. Then I learned about sun mapping. The first thing I did was to go to google maps and get a screenshot of my property. I marked the directions and every feature I was working with, like the gardens. As you can see from the image below my apple trees can't even be seen because the trees from the woods grow over top of them! This obviously blocks out the sunlight they need. We all know that the sun rises in the east and sets in the west...more or less. I just needed to check exactly how it moved over my garden. For my location I needed to see what time the sun came above the trees. I spent an entire day checking on the garden about every hour. I wrote down exactly when each section of the garden got sunlight. As the day ended I also wrote down when the sun was no longer hitting each section directly. This meant the sections in the back were often in shade because of the trees behind them or the plants in front of them. Or because the sun started to dip below the trees on the other side of the yard. The sad news was that my garden wasn't wholly in sun till after 1 pm. By 5pm shadows were being thrown on most plants by the plants in front of them. Even with taller plants in the back and shorter ones in the front, some shade was being thrown. This is bad news for plants requiring full sun. Unfortunately for me, many fruits and vegetables prefer full sun. Plants with full sun requirements need at least 6 hours of direct sunlight a day. Most do much better with at least 8 hours. Partial shade or partial sun plants like 3-6 hours of direct sun a day. Almost my whole garden gets less than 8 hours of direct sunlight a day. I really should have put it somewhere else! There are a few different methods you can use. The first is obviously the one I wrote about above. Write it down: Draw a map of your garden, or yard and write down when the sun first hits each area. Take notes every hour for a full day. If it's an area that goes back into shade as the day progresses, write that time down also. Photos: Pictures are an excellent way to track the sun's movement across your garden/property. Take a picture of your yard or garden every hour starting with sunrise. Take the photos from the same exact spot each time. You'll be able to compare all the photos and see how many hours of sunlight each section gets. This is a great method because it makes it easy to flip back through the images and see patterns you may not have thought to write down in the above method. Of course, if it's not the growing season when you're doing this your calculations are going to be slightly off. You'll need a sun calculator or estimator for now. Apps: There are several apps that can track sunlight for you. Sun Surveyor can help you to track the sun over the area you chose. Sun Locator lite and Sun Seeker - Sunrise Sunset Tracker are both great for gardeners. There are dozens of free apps to choose from just hit up your play or apple store. Sun calculator: Use an online Sun Calculator to map the sun over your garden. SunCalc.org is one that I like. Just pick your location on the map, change the date and time and it will calculate where the sun will be in the sky. As you can see from the image below, the sun at noon is still behind the trees by my garden. The red dot is directly on top of my garden) If I was looking to plant at the front of my house, I would advance the time until the sun line clears the house and use that to determine how many hours of sunlight that area gets. To understand the graphic a little better: the yellow shaded area is the entire movement of the sun throughout the whole year. The orange line on the right is sunrise and the reddish line on the left is sunset. The line in the center is the time I chose which was noon. The arched line is the path the sun is taking that day in May. This is an awesome tool if you're planting in an area for the first time, just moved etc. Of course as the months change the sun's angle will be changing slightly, so you'll also want to check that against your projected harvest dates to make sure that something like a house won't be in the way 3 months from now. Pretty neat, right? Since the angle of the sun changes in winter, it now appears to be following a more southern path above the trees, so much of my yard is in shade all day long. The closer you live to the equator the less of an angle the sun will have in winter, but I'm pretty far away up here in Pennsylvania. This can also come in handy when deciding where to put a greenhouse or sunroom. Of course all the estimates and calculations pale in comparison to actually experiencing gardening in your particular spot. For instance while I can see the trees in these images, I can only estimate when the sun will clear them. Logic says a garden in front of a 30 foot tree will be in shade longer than one by a 10 foot tree, but how does that translate to your trees? Plan your garden using these estimates now, then as the growing season progresses take note of any adjustments that need to be made for next year. While I do still make mistakes with my plant placement, since I started sun mapping my garden it's much easier to find the right spot for each plant!